Deanna Kahler invites readers to get into the spirit of love with this lyrical work. Connor was Celeste’s first love, but they parted, and she married Dave, with whom she has a son, Chip. After Connor is killed in an accident, his spirit reaches out to Celeste, leaving signs of his presence, even touching and kissing her. When Chip also begins to recount being contacted by Connor, Celeste tells Dave about the strange visitations. The communications with Connor make Celeste and Chip happy, but Dave is jealous. Frustrated, Celeste contacts a “spirit walker” who teaches her how to build a bridge from the physical to the spirit world, so that she can visit Connor in his realm. Together, in heavenly settings, they enjoy all-encompassing love. When Connor informs Celeste that he will no longer be communicating with her, she is left vulnerable to negativity and violence. Kahler, who has authored a nonfiction book about her experiences of miscarriage and adoption, writes in a pleasant, lyrical style suited to the fanciful intent of this novel. Her use of language is simple, yet at times rhapsodic (“she had entered a magical world where few venture,” “the bright, yellow-orange glow of the moon lit up her path”). Kahler has a firm grasp of grammar, and she rarely has a word or punctuation mark out of place, creating a narrative that is flowing and curiously believable, despite its offbeat subject matter. 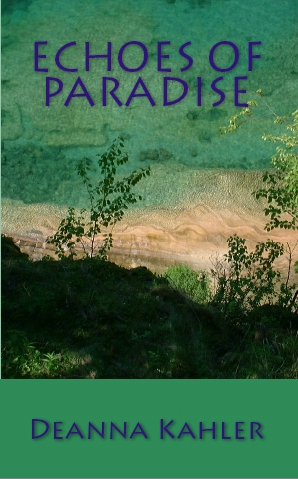 The author doesn’t offer any intellectual speculation about the paranormal; instead, she moves action along, switching viewpoints from Celeste’s longing for “echoes of paradise” with Connor to her little boy’s visions of Connor as an “angel” who has the power to make his mother happy and the pragmatic, generally disgruntled Dave, a devoted husband whose wife insists on spending time with a ghost. Celeste in particular shows a clear depth of change as her story unfolds; from being leery and skeptical, she moves to acceptance and determination to follow her intuition regarding her unearthly experiences. The cover art is pretty enough, but it evokes the natural more than the supernatural world. And there is one implausible and unnecessary plot thread, concerning the manner of Connor’s death. Minor flaws aside, Kahler’s story is emotionally resonant and competently told. With its dynamic female lead, Echoes of Paradise will hold strong appeal for creative, imaginative women who enjoy fables of mystical love and fiction that speculates about life after life.